Amplify Your Value – Publication Date Set! OK, folks! Some shameless self-promotion here! 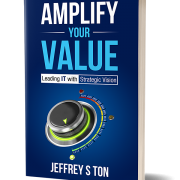 My new book Amplify Your Value – Leading IT with Strategic Vision will be published on August 13th! The Kindle e-book version is available now for pre-order on Amazon.com. The paperback and audio versions will be available on the 13th! If you would like to place a bulk order for 10 our more paperback copies (at a 20% discount) email me at Jeff.Ton@TonEnterprisesLLC.com! Interested in receiving a free two-chapter preview? Click here to download! /jst/wp-content/uploads/2019/01/Jeffery_S_Ton_340x156_darkblue.png 0 0 Jeffrey Ton /jst/wp-content/uploads/2019/01/Jeffery_S_Ton_340x156_darkblue.png Jeffrey Ton2018-07-15 14:18:172019-02-15 16:35:37Amplify Your Value - Publication Date Set! Put me in coach Amplify Your Value – Available Now!